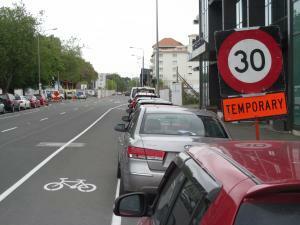 Gated 30kph temporary speed limit signs have been placed on Kilmore St halfway between Manchester St & Colombo St. There are no advance “Roadworks” signs, there is no work on the road (or within the road reserve) past them (apart from the Town Hall & Victoria Square works on Kilmore St & Colombo St, which have been there for ages without a TSL), and no derestriction signage at the end of the TSL. With regard to the lack of signs for the end of the TSL, luckily there are gated permanent 30kph signs on Colombo St (south of Kilmore) & Durham St (south of Kilmore), and gated permanent 50kph signs on Kilmore St (east of Durham), though these latter two are just on 400m from the start of the TSL. Unfortunately there are no gated speed limit signs on Colombo St (north of Kilmore) or Victoria St (north of Kilmore). Maybe CTOC could do an audit of this site, since CoPTTM seems quite clear that installing or leaving in place inappropriate or unnecessary TSL’s will result in the instant issuing of a non-conformance.